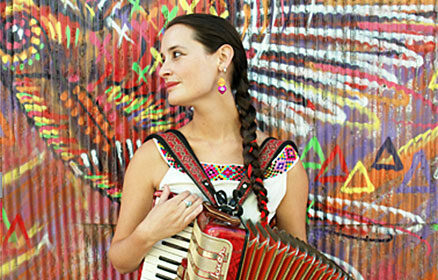 Accordion-wielding Pascuala Ilabaca is one of today’s leading singer-songwriters in Chile’s musical scene. Her sound is rooted in traditional Chilean sounds but incorporates jazz, pop and rock, and other musical influences from India to Mexico. Taking musical cues from Violeta Parra to Janis Joplin, Ilabaca and her band La Fauna – on accordion, keyboard, sax, clarinet, percussion, bass and guitar – sing socially conscious danceable songs with creativity and infectious fervor.